Students of a Bajhang school use e-paati. The coalition government formed after the 2006 Janaandolan, in its annual budget statement, announced the launch of ‘one laptop per child’ (OLPC) programme in a bid to promote the use of information and communication technology in government schools. The decision was made to emulate the success of similar programmes in other underdeveloped countries around the world. Therefore, the Nepali version of the programme not only borrowed the idea but also the name. 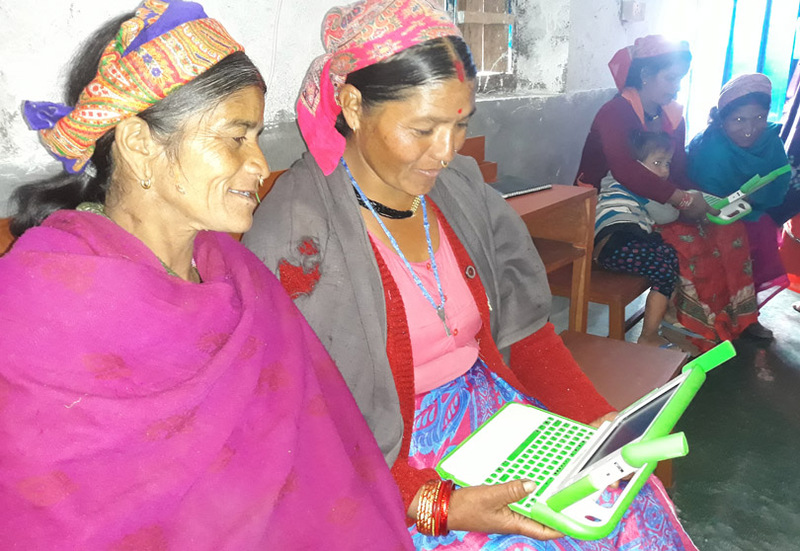 After the announcement, the Department of Education, as a pilot activity, distributed laptops loaded with child-friendly content to students of selected schools in Makawanpur and Mustang districts. Stakeholders enthusiastically applauded the government initiatives. However, the pilot lasted only for a year as the government dropped the programme in the next annual budget. A group of enthusiasts, closely following the developments, were worried about the government’s decision to discontinue the ambitious programme; they had thought it could bring a paradigm shift in Nepal’s education. The withdrawal triggered an innovative thought in them: Can a nongovernmental or private agency intervene and run exactly the same programme? After rounds of discussions, the activists concluded that they could launch the project themselves as an NGO. This is how Open Learning Exchange (OLE) Nepal was born in 2007. Now, the organisation facilitates ICT-enabled teaching and learning activities at various schools in all districts of the country except Manang. Three major programme components of the organisation have collectively changed the way that teachers and students would engage themselves in classroom activities. It is interesting to note that the NGO, born as a result of the government’s failure to continue its own programme, is partnering with the government for every activity it has carried out. The organisation’s Senior Manager for Training and Government Affairs, Tika Raj Karki, says his organisation continued distributing laptops to children of selected schools of Makawanpur and Mustang districts after the government pulled out. The programme was popularised with its international name ‘OLPC’ in the beginning. But, OLE Nepal, after it took over, found the acronym quite difficult for children and their guardians to understand and remember. Hence, the name was changed to ‘e-paati’. The organisation and the Department of Education signed an agreement to run the programme jointly in 2008. They have been renewing it every year since then. Currently, around 150 schools have been using around 6,000 such e-paatis (laptops). In addition to pilot districts of Makawanpur and Manang, select schools in Lalitpur, Kavre, Kapilvastu, Bajhang, Baitadi, Doti, Dadeldhura and Darchula are using the facility. The World Food Programme is sponsoring the programme in five far-western districts. There are some other donors too. 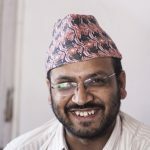 The organisation conducts occasional fundraising campaigns to ensure the sustainability, according to Karki. Besides, some individual donors, both from Nepal and abroad, want to support schools they know with the project. Therefore, the project has its presence in few schools in other districts as well, he adds. Karki informs that the organisation began distributing a laptop to every child of the selected schools in the beginning as its name suggests. However, they later realised that if the laptops could be shared among children of different grades, more kids would benefit from limited resources. Students of a Kathmandu school use e-paath. The e-paatis are loaded with e-paaths along with other resources. E-paaths are lessons that have been prepared following the curricula designed by the Curriculum Development Centre. Further, the CDC monitors the contents of e-paaths at the beginning of every academic season and the organisation distributes the contents only after getting the Centre’s approval. The e-paaths are not just computer versions of textbooks. They contain interactive lessons with animation videos, sounds and pictures. Karki says exercises given in the textbooks are not enough for diligent students; therefore, the e-paaths have additional exercises too. Likewise, he hopes that the organisation would be able to produce contents for students up to Grade X in the next few years. Teachers are trained to use e-paati and e-paath. Whereas e-paati and e-paath are offline programmes, the organisation’s e-pustakalaya has been providing benefits to both online and offline users. The NGO claims it is the biggest online library designed for schoolchildren, guardians, teachers and stakeholders in Nepal. The library currently has easily downloadable 8,000 pdf books, over 1,000 interactive lessons from the e-paath, and dozens of magazines and journals of education and child development sectors. Educational games and contents developed by other national and international organisations and companies including the British Council, Khan Academy and Pratham Books are also available. All the contents are open licensed and hence free to download. On the basis of its reach also, this is the biggest e-library of Nepal, according to the organisation’s Library Coordinator Ganesh Ghimire. On average, more than 50,000 books are downloaded from the library free of cost every month. Anyone can access the site from any place in the world and read and download the contents online. The organisation also realises that not all schools in Nepal have online access and hence restricting the resources to online users would be against their objective. Therefore, the organisation has been providing offline servers loaded with similar contents to schools of rural Nepal. Currently, over 700 schools have such servers. Ghimire says the programme has reached all districts of the country except Manang. The number of schools has doubled in past one year as the government began providing Rs 650,000 to select schools to establish e-libraries. According to Ghimire, the government has been providing the monetary support to around 1,500 schools every year since last year. Interestingly, the OLE’s e-pustakalaya has been the first choice for most of the schools to properly utilise the money because other resources available in the market are not as rich and easy to use as the e-pustakalaya. Generally, a school buys computers and server, sends the server to the OLE, and the organisation loads contents into it, and sends back to the school. Likewise, old servers are sent to the organisation every year to update the contents. Guardians of students are trained about e-paati. The organisation has also been providing training to teachers, students and guardians to effectively use available resources. Both Karki and Ghimire claim that concerned government agencies are actively involved in the implementation of the organisation’s projects. At the central level, the NGO has a partnership agreement with the Department of Education. The Curriculum Development Centre supports content development and updating. The National Centre for Educational Development is working together for teacher training programmes. District level offices are involved in the delivery of the programmes. Of late, local governments have also begun assisting schools to buy computers and install library programmes there. The government has announced various programmes to promote information and communication technology at schools and released budget for them generously. But still, some schools have been using computers just to train their teachers to type basic Nepali and English. “There are some schools which have launched computer courses but teach the students by drawing pictures of computer parts on blackboards. I visited one of such schools in Doti last year,” Karki says, hinting the budget has not produced effective results as intended. He suggests the government take initiatives to expand the reach of such programmes to remotest parts of the country. The OLPC programme in Nepal is a brainchild of the government, not NGOs. The NGO adopted the programme only after the government failed to continue it. Nonetheless, the two sides are working together to let Nepali schoolchildren have a better access to modern technologies. Impacts of the cooperation look commendable. Students of a school use e-paati. Yet, NGO workers themselves feel that the government has to take the lead in this transformation process.